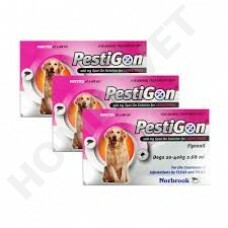 Pestigon Spot On Dog is a new Fipronil spot-on solution for external use on dogs against fleas and ticks. Description: Pestigon Spot On Dog is for the treatment and prevention of infestations by fleas and ticks and as part of a treatment for flea allergy dermatitis, where this has been previously diagnosed by a Vet. Also for the control of infestations of biting lice on dogs. For the treatment and prevention of fleas use every 5 weeks. For the treatment and prevention of ticks, and if part of treatment for flea allergy dermatitis use every 4 weeks. The insecticidal activity against a re-infestation with fleas is maintained for up to 6 weeks. Effect of up to 4 weeks against ticks and floodplain of up to 3 weeks against brown dog ticks. Not in dogs aged less than 2 months and / or with a body weight less than 20 kg. For external use only on the skin. 1 pipette of 2.68 ml is sufficient for the treatment of a dog with a body weight of 20 to 40 kg, which corresponds to the minimum recommended dose of 6.7 mg fipronil / kg body weight. The minimum interval between two treatments should be not less than 4 weeks.